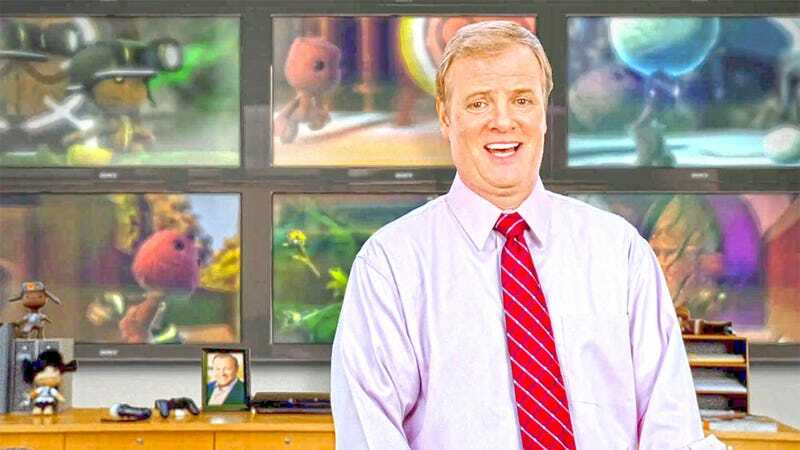 Following a bizarre turn of events and a highly unlikely TV commercial, actor Jerry Lambert—for years the "face" of the PlayStation brand—is being sued, along with Bridgestone, by none other than Sony itself. Despite having made something of a name for himself playing the fictional PlayStation executive Kevin Butler, last month Lambert appeared in an advertisement for Bridgestone tyres playing a competitor's product, the Nintendo Wii. Strangely, the commercial was later edited to remove Lambert from it entirely. Which seemed weird, but it may be explained by the fact that on September 11, Sony Computer Entertainment America filed a suit (spotted by gumby_trucker @ NeoGAF) against both Bridgestone and Wildcat Creek, a company registered in 2007 by... Jerry Lambert, who according to California Secretary of State data is also its president (it appears to be the registered name for Butler's handling of his business affairs). UPDATE - Sony has told Kotaku the suit is being filed because "Use of the Kevin Butler character to sell products other than those from PlayStation misappropriates Sony's intellectual property, creates confusion in the market and causes damage to Sony". Sony is suing both companies over trademark infringement, I'd wager for their use of Lambert - synonymous now with the PlayStation brand—in a scenario involving video games that aren't PlayStation games. It would also be crazy if the fine print of Lambert's contract with Sony didn't include some mention of not being seen to endorse competing products for some set amount of time. We've contacted both Sony and Bridgestone for comment on the specifics of the case, and will update if we hear back. UPDATE - It appears attempts have been made to settle the suit privately, but these have not proved decisive, with the court ordering that both parties commit one way or another to a formal hearing by October 12.